Although DNA-PK activity has proved to be essential for efficient NHEJ, the identification of cellular substrates, except DNA-PK itself and a few targets, remains an open question. Our strategy relies on isolation of DNA-PK dependent phosphorylation sites on proteins extracted from damaged cells by mass-spectrometry analysis thanks to a collaboration with the dedicated platform in IPBS. This strategy led us to identify the essential SAFA protein as a new cellular DNA-PK substrate (Britton et al, 2009). 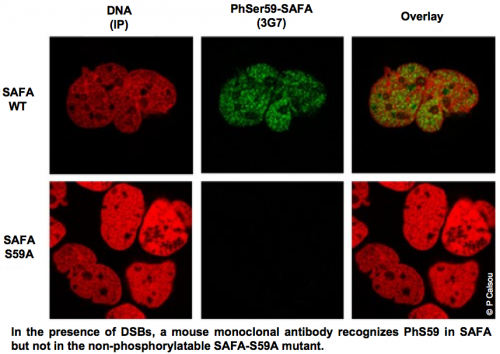 A DNA-damage inducible phospho-serine has been characterized on this protein and shown to be strictly DNA-PK dependent upon DSB cellular infliction by use of a home-made phospho-specific antibody. We now search for a functional link between this protein, NHEJ and more generally the cellular DNA damage response. Similarly, the strategy of identification of DNA-PKcs substrates in cellulo described above has allowed the isolation of nine phospho-Ser on a NHEJ protein. Among them, some are DNA-PK dependent and appear at high dose, whereas others are constitutive and DNA-PK-independent sites which are reinforced after low doses. We now aim at understanding the cellular functions of these phosphorylations. NHEJ represents a potentially important target for adjuvant treatments aimed at radiosensitizing tumor cells and improving radiotherapy efficacy. In a recent report we demonstrated that ectopic overexpression of LigaseIV (LigIV) fragments competed efficiently with endogenous LigIV for XRCC4 binding, resulting in endogenous LigIV degradation and subsequent NHEJ impairment and radiosensitization (Wu et al, 2009). 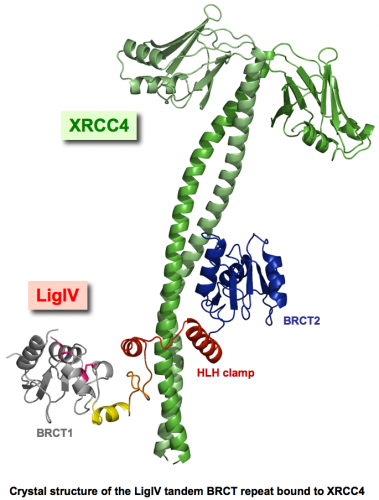 We also reported the high-resolution crystal structure of human XRCC4 bound to the carboxy-terminal tandem BRCT repeat of LigIV. The XXL complex (XLF-Cernunnos/XRCC4/LigIV) is the limiting component of the reaction and its function is more restricted to NHEJ compared to DNA-PK. Thus, targeting ligation could achieve a more selective toxicity on irradiated tumoral tissues and less adverse effects. We have undertaken a conjunction of biophysical and biological approaches to target the ligation complex in cellular radiosensitization strategies.